“Tidying Up with Marie Kondo” on Netflix has caused such a movement- exactly what we love to see. Throughout the years, I would recommend her book to my clients. And now so many people are influenced by her show and motivated to let go. It is the perfect time for a Closet Cleanse to transform your closet and create the wardrobe you love. Because in your closet it’s not only about clearing out but also about how things look. There is an art to styling that goes with organizing. It changes the way you think about your image and the material world. It helps us find simple ways to use what we have and modify what we don’t use. The urge to shop is replaced with the desire to play dress up in your own closet. Call us for your consult today. Have you visited Deja Vu lately? We had our own organizing project, pop by on a Friday or Saturday to see the fresh look. We have new store hours during the week- by appointment or buzz in 11AM-5PM. 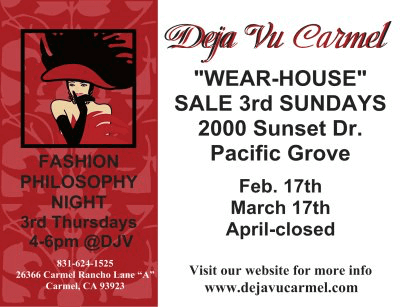 Come check out the new and improved Deja Vu Couture Carmel and receive 50% off most items for the month of love! We are hosting our third Thursday event February 21st, from 4-6PM at DJV with a focus on Velvet. And a special jewelry trunk show by a local artist. Meet Caroline, the talented designer who combines silk fabrics with diamonds and pearls. Don’t miss our extraordinary monthly “wear-house” sale Sunday, February 17th from 11AM-3PM.